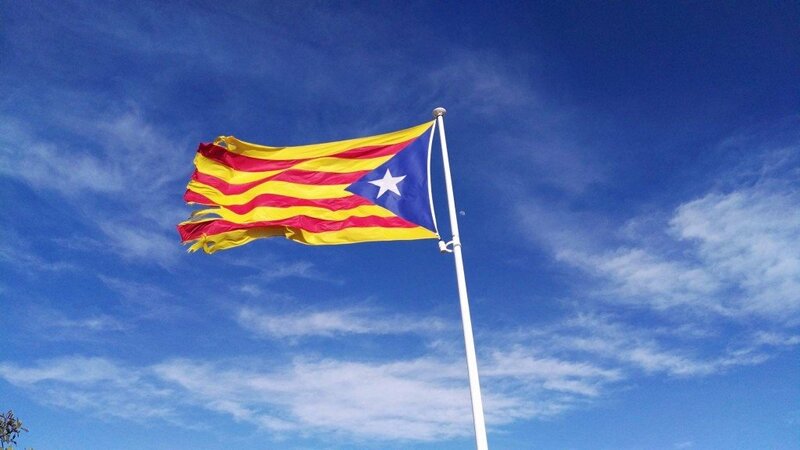 The Estelada flag of Catalan independence. Thursday at Barcelona Meeting Point (BMP) – one of Spain’s biggest property fairs – I had a chance to talk to several players in the industry about the impact of Catalonia’s constitutional crisis on the housing market. Unsurprisingly, they all report that foreign buyers looking at property in Catalonia are holding back until the situation becomes clearer. For those of you who don’t know, Catalan separatists with a slim majority in the regional parliament are trying to break away from Spain on the basis of a disputed referendum, and without the support of a majority of Catalans. This has caused a constitutional crisis, conflict between Madrid and Barcelona, poisonous division between Catalans, and lots of uncertainty. As a result, some 800 companies have announced they are moving their registered offices away from Catalonia, and the crisis has been widely reported in the international press, especially violent clashes between riot police and people trying to vote in an illegal referendum. Yesterday the national Government in Madrid suspended Catalonia’s autonomy to impose direct rule for six months until regional elections can be held, which Madrid hopes will unblock the situation by denying the separatists of their slim majority in the regional parliament. My conversations at BMP were mainly focused on Barcelona, but I guess it’s the same story in other parts of Catalonia like the Costa Brava and Costa Dorada. In Barcelona foreign buyers have gone from record levels in September to zero in the first two weeks of October. “It’s a disaster” one leading agent told me, though another told me that a few buyers were back in the third week, as the crisis seemed to subside or lose the attention of the international press. Foreign buyers are holding back for reasons that are easy to understand. As far as most people are concerned, this crisis exploded out of nowhere and took the world by surprise. One day Barcelona was this groovy city with a stellar international reputation, the next day it was in the news for violence and political conflict. Everything has happened so quickly that foreign buyers are pausing to see what happens next. The sense I get is that most people are putting their decisions on hold for a few weeks, rather than walking away. The crisis might die down as quickly as it flared up, so no harm in playing wait and see. But, if the crisis drags on, or things get worse, people will start to walk away. Whatever happens, Catalonia’s reputation as a stable place to invest has already been damaged, and the Spanish Government doesn’t look good either. So far there are no winners in this drama. Local demand, on the other hand, has shown no signs of nervousness, several agents told me. Local buyers are far more sanguine about the situation, and they have to get on with their lives. So the only market suffering thus far is the prime market in Barcelona city centre where foreign buyers are a big part of demand. Foreign investors financing new developments and building renovations are also holding back for now whilst they review the situation. The situation is not good, but as one agent pointed out (looking for a silver lining) if this political crisis helps to cool the market for a while, before returning to more sustainable growth, that would be no bad thing. House prices in Barcelona have been increasing by between 10% and 20% per annum, depending on whose figures you look at. The market was hot and getting hotter, and there was a risk of imbalance building up. Steady growth or stability would be much better, and if that emerges from this crisis, assuming it is resolved without too much drama, that would be positive news. Of course there is a risk that things could get worse, because this crisis has deeply polarised Catalan society, and inflamed passions in the rest of Spain. As a foreigner I can talk to both sides without emotions boiling over, but that is no longer possible for many locals. Even so, I expect this crisis will be resolved, as both sides have too much to lose, though wounded pride means a significant minority of Catalan’s don’t want to back down whatever the price, and a small minority of the hard left are itching for a fight. From what I can tell, Catalonia has the most to lose, and Madrid holds the strongest cards, even though it doesn’t play them very well. Damage has already been done, mainly to reputations and feelings. But Barcelona is still one of the most attractive cities on the planet, and Catalonia one of the most beautiful regions in Spain. That won’t change (in the absence of violent conflict), and foreign buyers will be back once the crisis is resolved, though perhaps more cautiously in future. That’s how I see it, though maybe it’s just wishful thinking on my part. But if I’m right, it might even be an opportunity to buy on better terms. Throughout this crisis life goes on in Barcelona pretty much as normal, though peaceful demonstrations have disrupted traffic on quite a few days. A friend coming over from England today sent me the following message: “Can’t wait to see you. Can we go on a demonstration? !”.